Galley Wench Tales: Feel Lucky? Bold graphics at Auckland Museum's special volcanoes exhibit. Mt. St. Helen's volcano territory. 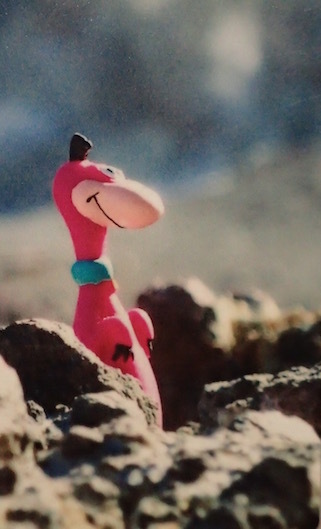 "Right now, you are standing on the rim of a volcano. Do you feel lucky?" - teaser from Auckland War Memorial Museum's special volcano exhibit. 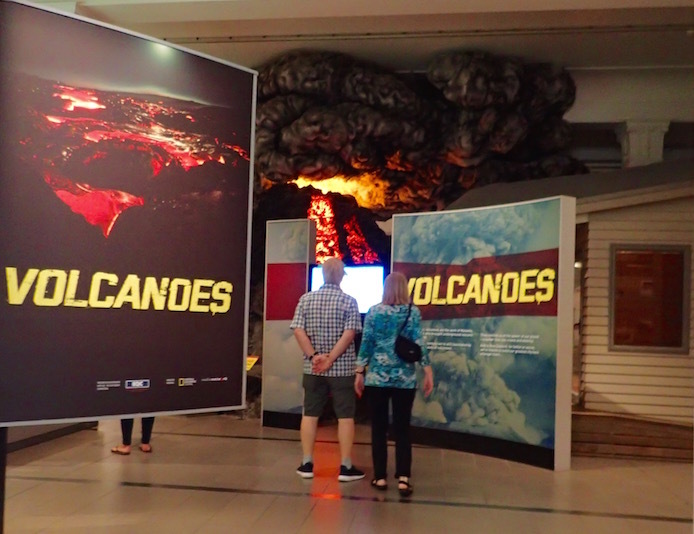 This sizzling exhibit drives the point home that Auckland - and much of New Zealand - was formed volcanically, by still-active volcanoes. this lava flow model will! Ironically, our volcanic museum tour was prompted by visiting Vancouver Washington USA (aka "the other Vancouver") friends, Katlin Smith and Gary Kokstis. Figuring prominently in the display, is the relatively recently erupted volcano (May 18, 1980) from our "backyard," Mt. Saint Helens. The St. Helen's focus centers on the human response to the those caught in that eruption. What makes the Auckland Museum's exhibit particularly interesting is its multi-sensory approach, and thought-provoking use of multimedia. 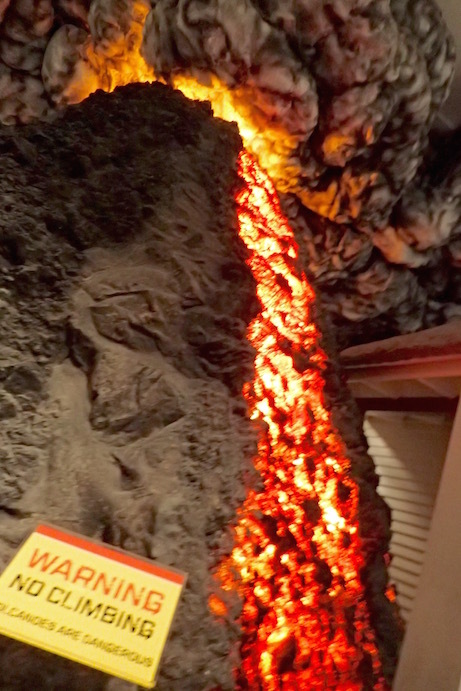 A realistic-looking towering model of a lava flow encasing a home greets you just inside the exhibit's entrance. 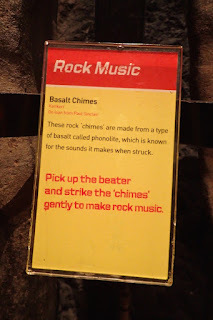 My basalt "rock music" audio coming later. 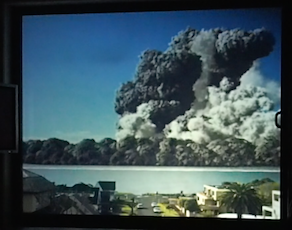 A simulated newscast, featuring an interview with a volcanic expert covers the scene using modern assessments taken from data about Auckland's volcanic potential, accentuated by the kind of public behavior often exhibited in natural disaster evacuations. Videos graphically show both the theoretical dynamics of volcanic eruptions, interlaced with imagery of actual eruptions. Various volcanic rocks are displayed for touching, and lifting. 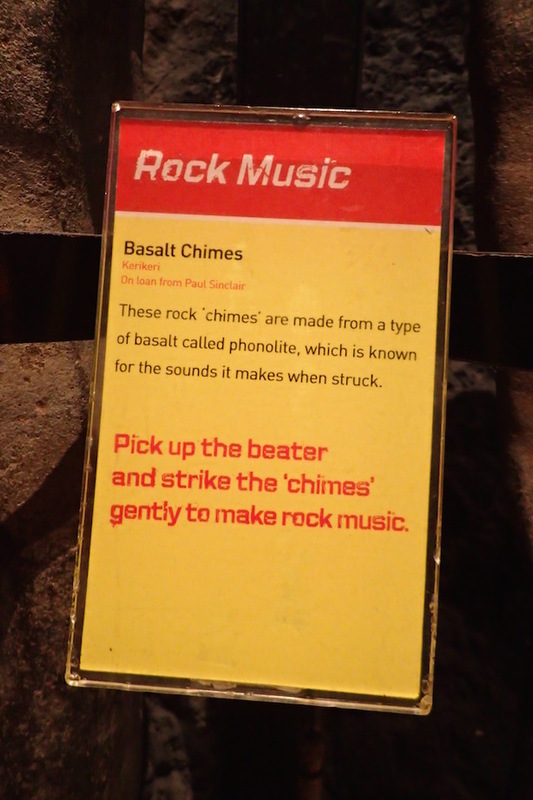 You're encouraged to make your own "rock concert" by striking basaltic stones for a range of tones. If the curators figured out an appealing way for visitors to smell and taste it, they likely would. However, sulphuric and poisonous gasses likely wouldn't draw rave reviews, nor is volcanic ash a tasty treat. 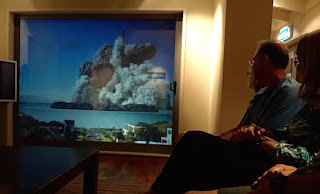 Auckland Museum's false calm in its volcanic living room. The coup de gras is the faux Auckland living room setting, likely inspired by the Mt. St. Helen's Coldwater Lake interpretive center. 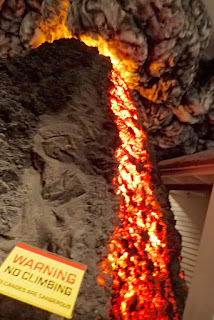 The exhibit coyly waits to strike... literally jolting you with its message; newscast warnings that it's not possible to "outrun" a 100 km wave of lava. You eventually notice your lovely view of Auckland's waterfront begins steaming, and after that, the action becomes truly explosive. 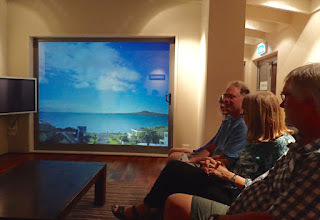 The Auckland Museum "living room" view is no longer benign! it's already too late to react! Auckland's last volcanic eruption was 650 years ago. Historically, there's eruptions every few thousand years. Exiting this powerfully deft combination of the science and human experience instills a sense of wonder, awe and some serious considerations regarding emergency preparedness, just in case. No wonder -- the exhibit is sponsored by the Earthquake and War Damages Commission (EQC). After all, if Auckland experiences an eruption, "feeling lucky" will be as likely as surviving Detective Callahan's (Clint Eastwood's) ire in "Dirty Harry." Considering that one of the highlights of our trip to Galapagos was hiking the steaming rim of Sierra Negra, which last erupted as recently as 2005, and that we also enjoyed the still-active volcano walks along the volcanically heated trail of Hawaii's Big Island, as well as "Soufreres" in St. Lucia and Martinique... in I guess we do feel lucky (and that likelihood is we'll "go" in other far more mundane ways). Nevertheless, kudos to the folks at Auckland War Museum on their unforgettable effort. involvement in WWI and II. We may be as little as 1-2 days away from "splashing" (getting off the stands, "on the hard" in Riverside Marina) in Whangarei (S35.43.674 E174.20.17). We need to test-drive a few things there first, like making sure our engine actually works with our boat in the water. Then we'll return to our pole mooring in Whangarei Town Basin Marina and resume more land-based travels until we jump to Fiji. From December 2014 - November 2015 we sailed from Jacksonville Florida to Opua New Zealand, Bay of Islands. Since sailing from Bay of Islands to Whangarei in January, we've mostly explored New Zealand by land. We'll resume serious cruising once cycle season ends, sometime between April and May, budget permitting to Fiji, New Caledonia, Vanuatu and Australia, where we plan to sell our boat.